a dessert person and loves to bake. By nature she is very sweet tand down to earth person. I knew her just for few months through this group and I felt like I knew her all my life. Her husband is also very humble and sweet natured person and together they cherish their space with innovative recipes frequently. She is a physiotherapist by profession but she chose to stay at home to take care of her 2 years old cute little girl. 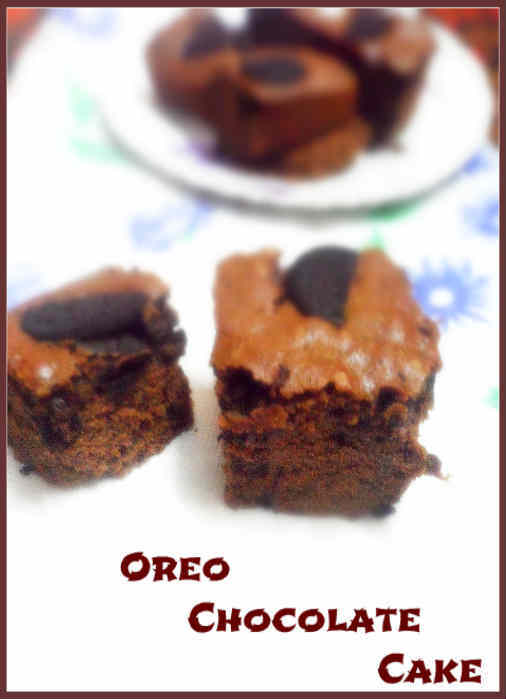 As I said earlier, I'm a big fan of her baking goodies and I was looking for some chocolatty goodness in her space, because my daughter was demanding for some chocolate cake for last few days and I found her Oreo Choco Brownies very decadent. So I went on to try her Oreo Brownie recipe. Her recipe was for small portion and I wanted to make it in larger quantity(when it comes to chocolate goodies, small portion is not enough for my two kids), so I increased the amount and instead of brownies I wanted to make a cake with the same recipe. 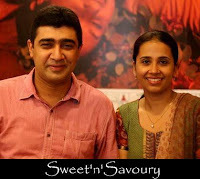 The end result was awesome and I got a good textured soft Oreo chcolate cake and my kids were happy. 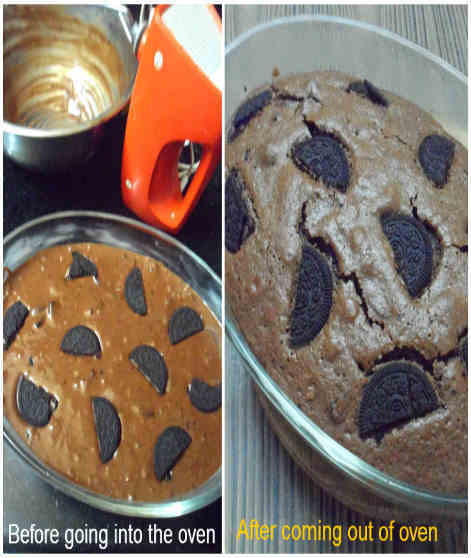 So I'll share the Oreo Choclate cake recipe with you, but if you want to bake the brownie, follow her measurement exactly. Here is the Original Recipe. Preheat oven to 180 degree Celsius. Grease your baking tin with butter and sprinkle some flour to avoid sticking to the pan. Melt butter in a pan over medium heat and add the chopped chocolate in there. Stir to combine well. if chocolate sticks to the pan, add 1-2 tblsp. milk and combine well. Remove from heat when chocolate melts completely. Take eggs in a bowl and whisk with an electric mixer until they triple in volume for about 3-4 minutes. Add the powdered sugar gently from the edge of the bowl to avoid knocking off the air in the eggs. Whisk till incorporated. In another bowl, take flour, cocoa powder, baking powder and baking soda, mix everything well. Now add 1/3 of the quertered Oreos and just fold in the batter. Pour the batter in the prepared baking tin. 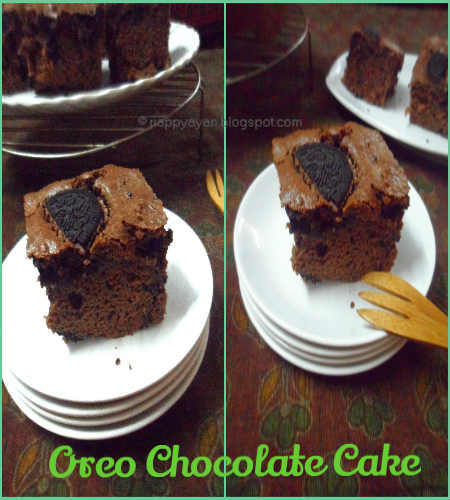 Arrange the leftover quarters of Oreos on top of the batter and bake for 45-50 mins or until a toothpick inserted in the center of the cake comes out clean. 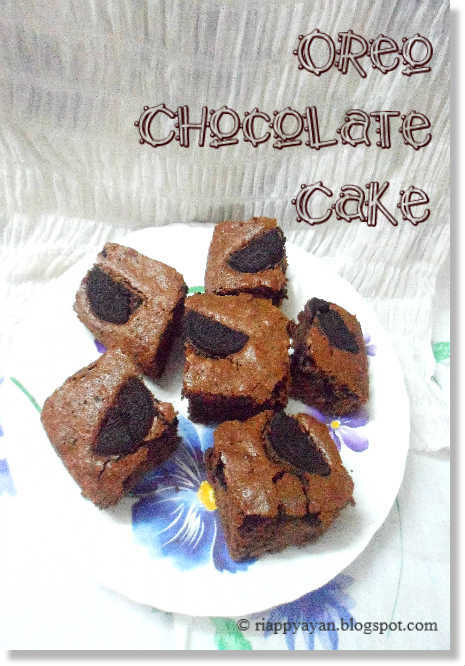 Mouthwatering and delicious looking chocolate savory cake. Wonderfully prepared. They look so decadent...feel like making them again :)Loved your cake version.